Star anise (also known as anise star) is a fruit native to Vietnam and China. It has the shape of a star with seeds tucked inside. Star anise has been used in Chinese medicine since antiquity, most notably helping with cases of rheumatism. 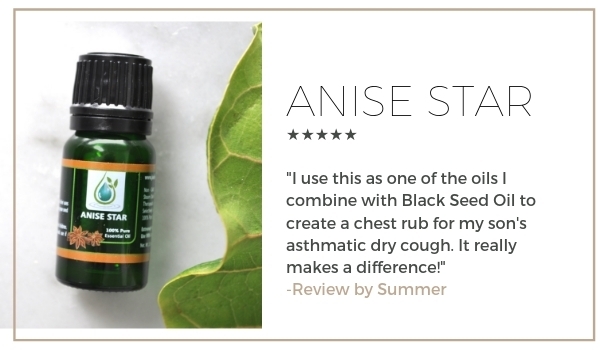 Anise star essential oil is considered to assist in expanding lung capacity, calming overworked muscles, working as an antiseptic, and an overall tonic to health. It contains anethole, the same compound that is found in the non-related anise, which gives it a similar scent. It is commonly used in toothpaste formulations, soaps, personal care formulations, and perfumes. Anise Star essential oil is reported to have potentially carcinogenic constituents. High risk individuals should be careful not to overexpose themselves to this oil. Please stay with in a 1.75% dilution ratio and use extra caution. "Both the essential oil [Anise Star] and trans-anethole exhibited strong inhibitory effect against all test fungi indicating that most of the observed antifungal properties was due to the presence of trans-anethole in the oil, which could be developed as natural fungicides for plant disease control in fruit and vegetable preservation." "I. verum has carminative, stomachic, stimulant, and diuretic properties, and is used as a pharmaceutical supplement"
"The essential oils of [Anise Star] I. verum and S. tenuifolia and their major constituents could be used to manage post-harvest diseases caused by B. cinerea and C. gloeosporioides." "Other studies have indicated that the essential oil of [Anise Star] I. verum has repellent and fumigant actions." Wonderful smell and makes a great addition to my water!! This oil has a licoricey, fennely smell to it, which I personally love. If you're not into licorice though... but its very nice. Love the smell and the high grade of the product. I love this black licorice aroma!! Very potent and delicious!! I use this Anise as one of the oils I combine with Black Seed Oil to create a chest rub for my son's asthmatic dry cough. It really makes a difference! Not a fan of the smell, but as far as the uses, its great.... has a very strong scent. Yes! This scent reminds me of those little anise mints from France. Smells delightful. l love those French mints with the anise in the middle. This reminds me of those. Lovely. This oil makes me think of Christmas. It's a warm spicy oil, but it's sweet at the same time. I must have if you like Cloves, Cinnamon or Allspice.